Are you in a situation that doesn’t seem to give you options for improvement or escape? Whatever it is, there is one resource you can apply that is capable of doing unexpected things. It is the word of God. God’s word is more powerful than we can imagine and His language differs from ours because He is perfect while we are limited. He sees the end from the beginning and sometimes addresses us in the past perfect on issues we feel are present. Don’t argue, just flow with Him. Hunker down with His word and receive a promise from it that will imbue your heart with faith. Then leave that matter in His hands, knowing that He will keep His word to you no matter how bad things get. Keep hope for your miracle alive for Jehovah is a faithful God. 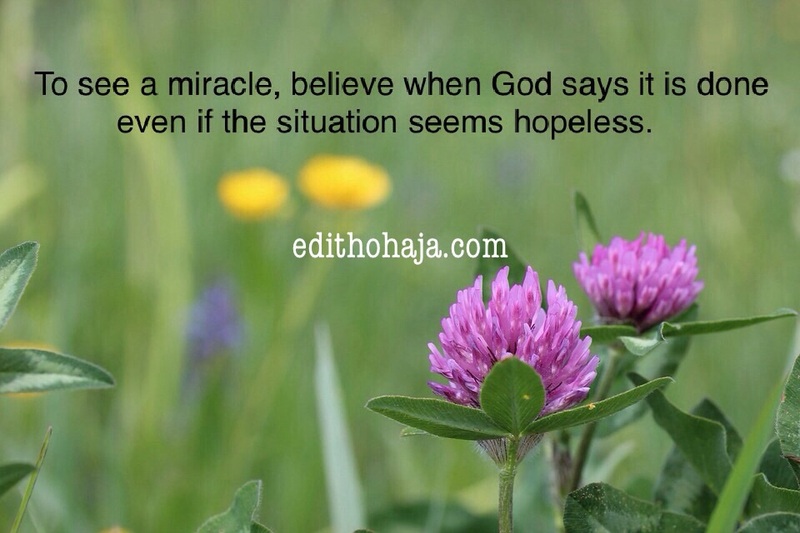 To see a miracle, believe when God says it is done even if the situation seems hopeless. (facebook.com/auntyedith), LinkedIn, Twitter and Google Plus. Jesus is Lord! To know that all these are coming from Aunty Ohaja who has not said anything else since I knew her, is refreshing for you know you are being encouraged and advised by the woman of God who has a daily encounter with God. Aunty, tell me more and may the God of love, miracles, faithfulness and hope hearken to the feeble in faith, even me, in Jesus name. Amen oh! Bless you, Doc! And my regards to your family. It is good to always trust in god because in him you can find rest. Faith is all it takes for your miracles to come alive! I believe in what God can do. He is a miracle worker. Thank you Aunty Edith. Miracles are out of the ordinary. Things we can't explain. Our God is definitely a miracle worker. Learn to believe in Him, folks! The easiest way to getting a miracle is trusting God for it, even when the situation seems hopeless.Our faith moves him.